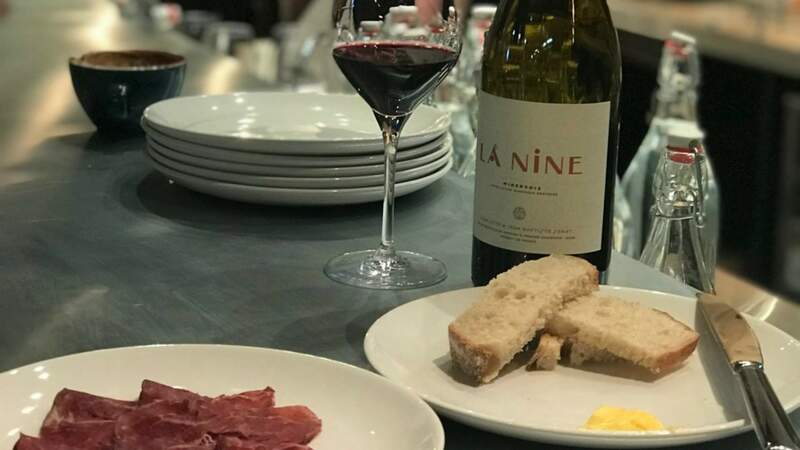 The idea behind Glass, a wine bar new to Chews Lane (aside from great times with people you love, and good wine, and good food) is transparency. Transparency in the origins of the neat, mostly French natural wine list, and transparency in the quality and origins of the ingredients that make up the dishes to complement them. It's in the name, really. Glass is where after work drinks turn into nibbles, then dinner, which turns into a late night — which turns into another visit in the morning for a restorative espresso by Peoples Coffee. Owner Jonathan Brookes is a New Zealander by way of Paris, where he and his wife Emily decamped so that he could study for his PhD seven years ago. Jonathan got a job in a wine shop — La Derniére Goutte, a little cellar in the St Germain neighbourhood. A love for wine stuck, the PhD didn't, and he and Emily both started work at Fish, La Boissonerrie, a little bistro known for its amazing wine list, before moving on to Verjus, a tasting menu-only restaurant where Jonathan was manager and in charge of the wine list. Back in New Zealand, he worked at Whitebait and Charley Noble before snapping up a lease of his own earlier this year, beginning an imports operation for his favourite French wines, and creating glass. Drinks are poured atop the shiny new zinc bar, which will gradually age to look more like the burnished bars of Parisian bistros. Perch up at the high table, or take a banquette seat. Glass is the sort of place where you immediately feel comfortable. The menu is a real story, with each ingredient sourced with care from good people. Housemade sourdough and butter is a must to start, complemented with plates of bresaola, made by A Lady Butcher, or roasted bone marrow with salt, lemon and fried capers — a homage to Fergus Henderson. Head chef Matt sees the menu as highly changeable. What is on the menu at the start of service will change and adapt throughout the day depending on what is fresh and available. We tried plates of green beans in white anchovy butter, roast chicken with cavolo nero and polenta, a dish of the best roast potatoes I've ever had, and an incredible vanilla bean rice pudding with lemon curd and fresh fennel. Each was unpretentious and generous. Expect vege-centric dishes priced around $7-10, proteins variable, desserts around the $10 mark. To drink, we started with a glass of the Bertrand Jousset Rose á Lies, before trying Antoine Arena, Bianco Gentile. Bianco Gentile is the name of the grape, native to Corsica, which Antoine rediscovered and replanted in the late 1990s. See what we mean about each bottle having a story? Glasses of Jean-Baptiste Arena Grotte di Sole and Sebastien Bobinet Saumur and Hanami were delicious with the roast chicken, and a glass of Roses de Jeane Val Villaine (pure pinot noir, one of Jonathan's favourite wines and an amazing example of how good grower Champagnes can be) to finish rounded out our night. The glass-sided space in Chews Lane is a fantastic exercise in placemaking in the formerly corporate-feeling laneway. Warm days (when they come) will see the doors pulled back and tables placed along the pavement to take the good times outdoors. What sounds better than sitting outside with a cool glass of Rose á Lies, a pét-nat rosé from the Loire Valley, in the hazy days of summer? We can't wait.